CONGRATULATIONS are also due to our office’s winners of the Berkshire Hathaway HomeServices 2018 Leading-Edge Society awards!!! 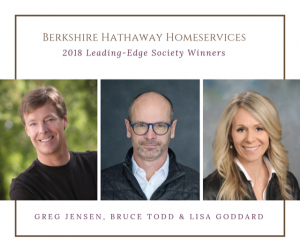 These agents are in the top 8% of all agents in the Berkshire Hathaway HomeServices network, which has over 47,000 agents and 1,400 offices in 47 states! These agents include: Greg Jensen, Bruce Todd & Lisa Goddard.